"Lake Garda Markets are the best places to find that shopping bargain!" 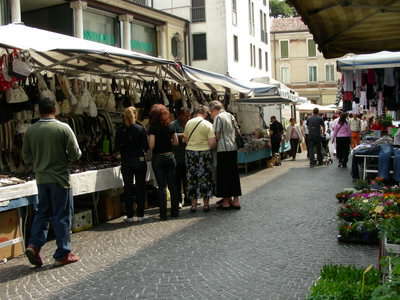 Lake Garda markets are on the go all the time and where ever you stay on the lake there is sure to be one near you. These street markets are usually held in the middle of town and roads are often closed off on market days to accomodate them. Markets are very popular in Italy and are a great place to save money on shopping! 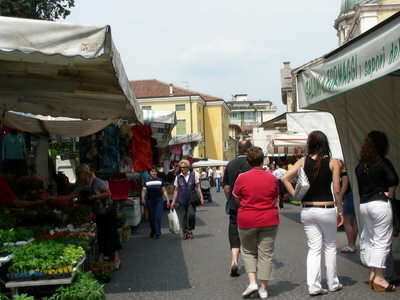 You will find a large range of goods on sale at the markets in towns around Lake Garda. Clothes, shoes and bags (of course), but also lots of fruit and veg, tools, household items and much more. There is a friendly atmosphere and it makes a nice and interesting alternative to the normal shops. Riva Del Garda area: Wednesdays at Arco. Antiques Market every 3rd Saturday at Arco. Garda: Fridays. Saturdays at Caprino Veronese (NE of Garda town). Bardolino: Thursdays. Mondays at Cisano di Bardolino (south of Bardolino), and Tuesdays at Cavaion Veronese (east of Bardolino). Antique Market every 3rd Sunday of the month. Peschiera del Garda: Mondays. Tuesdays at Castelnuovo del Garda (east of Peschiera). Saturdays at Valéggio sul Mincio (SE of Peschiera). Also an Antique market every 4th Sunday of the month at Valeggio. Sirmione: Mondays at Colombare (south of Sirmione). Fridays at Lugana di Sirmione (SE of Sirmione). Desenzano del Garda: Tuesdays. Sundays at Rivoltella (east of Desenzano). Antique Market every 1st Sunday of the month, also at Lunato (west of Desenzano) every 3rd Sunday of the month. Gargnano: Wednesdays. Tuesdays at Tignale (between Gargnano & Limone in mountains). Verona: Thursdays at Bussolengo (N.West of Verona). Antiques Market every 3rd Saturday of the month. Brescia: Antique market every 2nd Sunday of the month.